1.Preheat oven to 350°. Place baguette slices in single layer on rimmed baking pan; brush with 2 tablespoons oil. Bake 15 minutes or until lightly browned and crisp; cool. 2.In blender, purée avocado, 1/4 cup feta cheese, lemon juice and remaining 1 tablespoon oil until smooth, scraping down sides of blender occasionally. Makes about 1 cup. 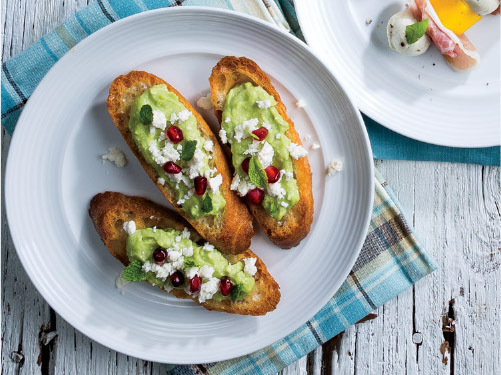 3.Spread baguette slices with avocado-feta mixture; top with remaining 1/4 cup feta, pomegranate seeds and mint.